A 43-year-old woman who was given incorrect test results and is now terminally ill with cervical cancer has settled her High Court action against a US laboratory for €2.5m. 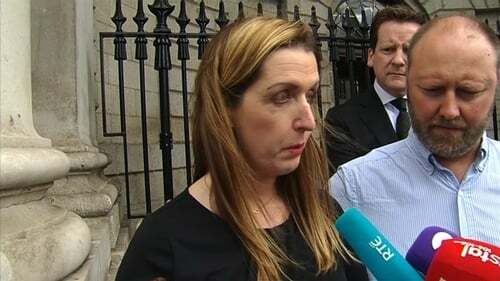 Vicky Phelan was diagnosed with cancer three years after her smear test results of 2011 were incorrectly reported as clear of abnormalities. By the time she had another smear test in 2014 she had cervical cancer. In January this year she was given six to 12 months to live. Mr Justice Kevin Cross described Ms Phelan as the most impressive witness he had ever encountered. He also praised both sides in the case for the speed with which the case was handled. In her High Court action, which began last week, her lawyers said if the cancerous cells had been detected in 2011 she would have had a simple procedure and would have a 90% chance of survival. Ms Phelan, of Carrigeen, Annacotty, Co Limerick along with her husband Jim Phelan has sued the Health Service Executive and Clinical Pathology Laboratories Inc, Austin, Texas, over a smear test taken under the National Cervical Screening Programme CervicalCheck and analysed in the US laboratory. This morning the court was told the case had now settled and the case against the HSE could be struck out with no order. The settlement with the US laboratory for €2.5m was made without admission of liability. A portion of the settlement will be paid into court and be held for the couple's two children who are now aged seven and 12. The settlement was reached in the case following the evidence by an expert witness called by Ms Phelan’s legal team. Is his evidence to the court on Tuesday, Professor John Shepherd a retired consultant gynecological oncologist said he had reviewed the case history and written a report. From his examination of the records, he was aware that a review which uncovered the false negative result of Ms Phelan’s smear test was undertaken by the CervicalCheck screening programme in 2014, but this was not communicated to Ms Phelan until 2017. Professor Shepherd said in his opinion this delay was "most irregular" and absolutely should not happen. He said from his review of the records of this case, Ms Phelan’s test was "one of a number of smears that had been reviewed and found to be wanting". He said documents relating to an audit seemed "confusing" and there was no direct advice as to how it should be dealt with. This, he said, would lead to "confusion and ducking the issue". "I think there is a moral and ethical responsibility of all professionals to notify the patient of any errors that have occurred," he said. Prof Shepherd was also asked about correspondence between Cervical Check and doctors treating Ms Phelan and other women which appear to show a difference of opinion about who should inform the patients of the mistakes that had been uncovered. In one letter, a doctor tells CervicalCheck that it would be "inappropriate for us to contact them at this point to tell them their original smears have been re-reported as showing different findings and we think that this would only heighten anxiety levels and not confer any advantage to them now". The national screening service replied that it "recognised there was a balance in terms of communicating the result of an audit particularly where women are unaware of its existence," but adds it was "up to you as clinical lead to use your clinical judgment with regard to these individual reports." Professor Shepherd told the court in his opinion the screening service was "ducking the issue" by telling doctors to use their clinical judgment. It was put to him that the only person who did not seem to have been involved in this correspondence was Ms Phelan. Prof Shepherd agreed and said she had been "totally ignored". Asked if in his view this was appropriate to ignore her, he replied: "No, absolutely not, nor the other ten that I have referred to." Prof Shepherd agreed to a question put by counsel that no one seemed to be taking responsibility for advising Ms Phelan about the original mistake. He said this was "unacceptable" and an overarching body should have been instigated by the HSE to advise on this. The court was told that CervicalCheck informed Ms Phelan’s consultant about the mistake in 2016 but there was a further delay until 2017 before she was told. Counsel for the HSE pointed out to Prof Shepherd that one of the reasons for the delay in Ms Phelan being informed was because a complete review going back to 2008 had been undertaken and it some time to deal with those affected by 2011 tests. Prof Shepherd also agreed during cross examination that there was no malice or lack of bona fides involved in the process. Today, Mr Justice Cross said he was delighted that the case had settled and said to Ms Phelan: "If anyone can beat this, you can." The court heard that despite her terminal diagnosis Ms Phelan is trying a new treatment in the US. Last week the High Court heard the smear test of 24 May 2011 showed no abnormality was detected and Ms Phelan was advised by letter in June 2011 the smear test detected no abnormalities. She had another smear test in June 2014 and when it was sent off for analysis it showed a high grade lesion and Ms Phelan was referred to a consultant. In July of that year Ms Phelan was diagnosed with cervical cancer and underwent radical chemo-radiotherapy. It was claimed that subsequent to her cancer diagnosis and unknown to her a review was carried out of previous smear tests from women who had a cancer diagnosis. A review of the May 2011 sample from Ms Phelan showed the original report in relation to the smear was incorrect and the smear test showed suspected cancerous cells. In September 2017, Ms Phelan was advised of the review and in November she was diagnosed with an incurable Stage 4 cancer and was given a life expectancy of between six and 12 months. It was claimed the alleged failure to diagnose the 2011 smear test sample caused a situation whereby Ms Phelan's cancer was allowed to develop and spread unidentified, unmonitored and untreated until she was diagnosed with cancer in July 2014. It was further claimed she was deprived of the opportunity of timely and effective investigation and management of her condition and deprived of the opportunity of treatment at a time when her disease was amenable to curative treatment. In a statement, the HSE said while the National Cervical Screening Programme is committed to providing the best possible service to women in Ireland it is "clearly of utmost importance to acknowledge the significant impact of this case on the client and her family". It said cervical screening cannot prevent all cancers and while regular screening can detect pre-cancerous changes early, "however screening tests are not diagnostic in nature and cannot always indicate the presence or absence of pre-cancerous changes. "Despite this, cervical screening represents one of the most effective ways to prevent cervical cancer". The statement continued: "CervicalCheck has detected and treated over 50,000 pre-cancerous changes in women, reducing their risk of cervical cancer by more than 90%. "Figures from National Cancer Registry Ireland show that the cervical cancer rate in Ireland has reduced significantly as a direct result of the CervicalCheck programme. "Despite these achievements, every diagnosis of cervical cancer is one too many and we acknowledge the impact of this disease on women and their families." In relation to queries from RTÉ News, as to whether there are any other cases of missed cervical cancer diagnoses, the HSE said it was not possible to get this information at this time of the evening.